BOSTON - A man in a white tank top with a big red heart on the front. Another wearing all blue. A woman with clothing from a St. Louis running store and one who printed "Lauren" on her shirt. Kara Bonneau logged onto the race's official photo site this week and saw pictures of four other people who ran Monday's race in copies of the bib she earned - and paid for. She posted those pictures on Instagram and asked for help in identifying the unofficial runners, known as bandits. Those outed for running with false bibs say they didn't mean any offense. After Boston TV station WCVB ran a story on Chelsa Crowley's banditry - she ran with her Twitter handle on her shirt - her husband, FourSquare founder Dennis Crowley, posted an apology on the station's web site. "Yes, using a duplicate number to get Chelsa into the starting corral with me was wrong," he wrote, explaining that they were separated near the finish line last year because of the explosions. "Our intent was never to 'steal' anything from anyone - our intent was to finish the Boston Marathon together as we tried to do last year." 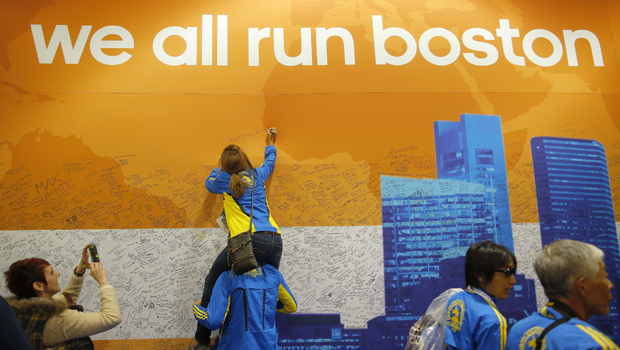 "The BAA does take these matters seriously," executive director Tom Grilk said Friday while stressing that the bandits went through the same security checkpoints as the official runners. "The adjudication committee will decide what action will be taken," he said, "with full consideration to the impact of cheating on those who have worked so hard to qualify and those who give so much of themselves to raise money for our outstanding local charities." There is a long and even proud tradition of bandits in the Boston Marathon, with Roberta Gibb running unofficially in 1966 to shatter the ban keeping women from the race. But while adding a few hundred unofficial runners in the race's infancy might have been a minor inconvenience, the growth of the event - and the security needs after last year's bombings - have made banditry a bigger problem. "Fluids, medical care, and traffic safety, are provided based on the number of official entrants," organizers said on their website. "Any addition to this by way of unofficial participants, adversely affects our ability to ensure a safe race for everyone." But there's another problem with bandits, and it's the one that makes serious runners chafe like cotton shorts on a cold day: Because Boston requires most runners to meet a qualifying standard, showing up on race day is only part of the feat. "There's two parts of that marathon: There's qualifying to get there, and then there's running it. Anyone can go the 26.2 miles," said Michael Sullivan, who found another man wearing his bib No. 10055 in the race photos. "Anybody who has strived to run it, or strived to get there, or is a runner who understands how difficult it really is." Sullivan said he simply wants them to be exposed: "Their family and friends need to know they cheated," he said. It was one thing when runners would merely join the race to see what it would feel like to be part of the Patriots' Day event. But using a fake bib and getting all the amenities available to the registered runners - including the finisher's medal - is what "ticks me off," Sullivan said. "In my little community, we don't even wear the race shirts they give us for just registering until after we finish," he said. "It's not a life and death thing. . .It doesn't take way from my awesome experience in Boston. "People who are not runners, they don't really have that sense of how hard it really is," Sullivan said. "They say, 'What's the big deal?' I'm on the side of the fence that says, 'Just do the hard work to get there.'"